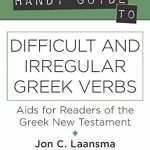 Kregel Publishing sent me a review copy of the book, The Handy Guide to Difficult and Irregular Greek Verbs. As any student of Greek knows, there are numerous Greek verbs that make absolutely no sense when it comes to their principal parts. This handy little book (it’s only 80 pages) pulls all these words together and arranges them by order of frequency. In my personal Greek notes, I have a sheet from one of my Greek professors, Dr. Elodie, on “The Dirty Dozen” and another one from Dr. Hoe which contains a larger list. You can download the Cheat Sheet to Irregular Greek Verbs here. I apologize for the scribbles all over these sheets. The book, of course, is quite helpful, as it provides a much more detailed list of irregular Greek verbs, arranged by frequency, as well as an alphabetical list in the back. There is also a short chapter on the tricky eimi conjugation. These sorts of guides and cheat sheets are not provided for the purpose of memorizing these difficult words. As the authors point out, after two or three semesters of Greek, the best thing a Greek student can do is simply take out their Greek New Testament and read, read, and read some more. As the student comes across words they do not understand, they should look them up in a Greek lexicon. Sometimes, however, the student looks up the word in the lexicon, and cannot find it. This is often because the word might be one of the difficult Greek verbs. In this case, a quick and easy guide such as this book, or the cheat sheets above, might be useful. Over time, as the student reads, they will find that they need to refer to these tools less frequently. 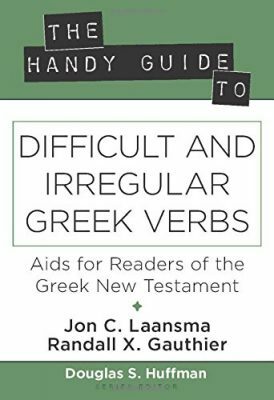 So if you are learning Greek, or looking for a good tool to help you learn the difficult and irregular Greek verbs, I recommend you get a copy of this short little book and keep it close by as you read your Greek New Testament.